Though email attachments are a well-established fact of life, past versions of iOS haven’t always made them easy to work with. Fortunately, that changes in iOS 9: It’s now a lot easier to add attachments to, and to save attachments from, Mail messages. The new iOS finally brings to the iPhone and iPad abilities that Android users have enjoyed for some time now. In the past, creating an email with an attachment in iOS meant going to the app in which the file was created and hoping it gave you the option of sharing the file via email. Should your file be somewhere other than iCloud, don’t fret: Tap the Locations button in the top-left corner of the window for a list of other storage providers registered with your device. These are generally apps that have their own local storage or those (such as Google Drive, Dropbox, and OneDrive) that let you access remote storage. Once you’ve located the file you want, tap it; an icon should appear in the body of your message, indicating that the attachment was successful. 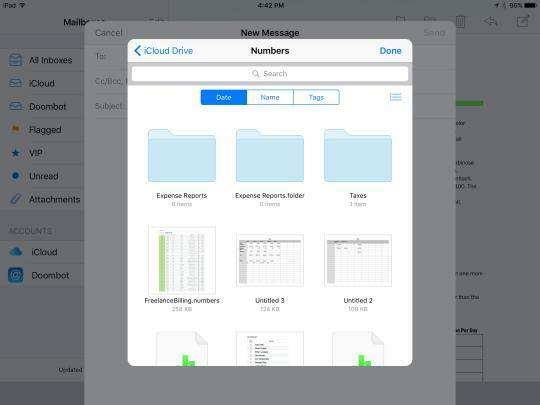 Once again, a Document Chooser will open, displaying your iCloud Drive. Choose the folder in which you’d like to store the document, then tap the Move to This Location button at the bottom.